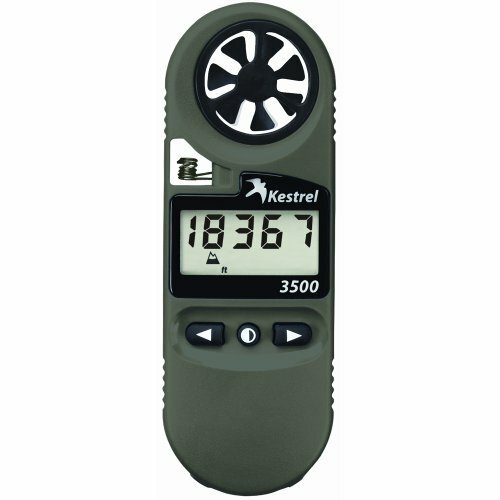 The work load for the Kestrel 3500 pocket weather meter covers much territory. Whether you are a scientist on a exploratory trip, or a policeman out doing your daily job, you will find this weather tool to be of a major benefit to you. 1. Wind Speed-This will be the average over the previous three seconds. The reading will be accurate for the air flow either through the front or rear of the unit. 2. Maximum Wind Gust-This reading will be the average of the last three wind speeds registered since the unit was turned on. 3. Temperature-This is the reading from the thermistor, which is located at the end of the coiled leads (in the open cavity) below where the impellor is located. In order to get the quickest response, either wave the unit back and forth lightly or face it into the wind. This will get you a quick reading. You may also get water and snow temperatures because the unit will allow you (it is waterproof) to submerge it into either the water or the snow. 5. Relative Humidity- this is defined by the National weather service and meteorologists as “the amount of moisture in the air compared to the amount of moisture the air can hold for the given temperature, represented as a percent”. This reading should be taken in the shade. The response time will depend on how quickly you are getting the temperature reading. 6. Heat Stress- the combo of higher temperature and the present humidity. – combination of temperature and humidity. Anything below 75 degrees will just be the temperature that is currently present. 7. Dew Point- in understanding this always remember this information: If the temperature and dew-point are the same, dew will form. If this happens below freezing frost will form. You can be assured that if the dew-point is very close to the temperature, than know that it is humid out right now. This is calculated by mixing the relation of air temperature with the humidity measurement. 8. Wet Bulb Temperature- this is not a widely know reading. It is the mixture of temperature and the humidity levels. It deals with the evaporation rate present currently. Know this, if the wet bulb temperature is very close to the air temperature, the air is humid. Every Kestrel is designed and manufactured at NK’s (Nielsen-Kellerman) facility in Boothwyn, Pennsylvania Near Philadelphia, Pa. The actual size of this tool is 4.8 x 1.9 x 1.1 in. Use only new CR2032 coin cell batteries. Wipe the battery clean of any fingerprints and insert the positive (+) pole up, angling the battery downward and pressing it firmly into place. You can get up to 300 hours of use from one battery. These are not the easiest batteries to find around. Amazon does stock them HERE . ✅ A small package but a powerful versatile weather meter. Customers have openly offered that Kestrel offers very good phone support. It is quick, responsive and accurate in getting your problem solved. They come highly recommended for all of their product line. This model isn’t any different. It is currently looking at a 4.7 star rating on Amazon as an example. That is really impressive in the sense that the 4.7 star review rating is out of a 5.0 for the perfect rating. They are very accurate, and with the support that is offered purchasing a Kestrel 3500 would be very difficult to beat. Top of the line for a weather meter of the pocket variety. It does fit very well in a pocket too. Customer’s look at cost as either an investment or an expense. In this case it is an investment in your purchase. The quality is unmatched in the market. The support is top of the line and the service provided by the product is excellent as well. It is built to last. When you compare the quality difference of the Kestrel compared to competitors the Kestrel faces. The quality difference far exceeds any price differences you may find in the market currently. A market competitive price and better than built in quality. A market advantage for them. 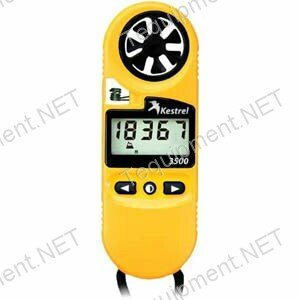 This Kestrel Pocket Weather Meter can do quite a bit and very accurately for such a small device. Wind speed can be measured in miles per second, km/h, mph, fpm, tks, or Beaufort from 0.8 to 135 mph. It can accurately display temps in degrees Fahrenheit or Celsius, wind chill, relative humidity, heat stress, dewpoint, wet bulb temp, barometric pressure, pressure trend, altitude, and time. Not only can this instrument do all of these things, but it also very rugged and easy to use. It has a large, precise replaceable impeller, a fast and accurate humidity/temperature sensor, pressure trend indicator, data hold function, large backlit display, and real time clock. It is also waterproof and will float if dropped in the water making it easy to find with its bright yellow color. 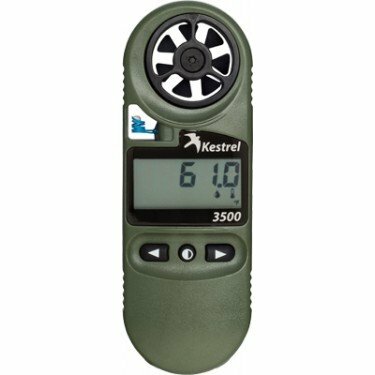 The Kestrel 3500 Pocket Weather Meter takes CR2032 batteries. It comes with built in adjustable lanyard, protective case, and a soft storage satchel.